DDA gives the MPL website a fresh, cutting-edge look. In 2006, DDA helped Medical Product Laboratories (MPL) increase their online exposure with the development of a new professional website that addressed and advertised the company’s expertise in the manufacturing and distribution of fluoride pharmaceuticals. Over the years, the site gained strength, climbing to the top pages of major search engines like Google. When it came time to give the site a new and refreshing look, MPL once again turned to DDA for their proven website design and redevelopment services. In redevelopment of the MPL website, DDA was tasked with the responsibility of achieving a professional and updated look, while maintaining the site’s impressive SEO strengths and standings. DDA’s staff of web architects, SEO specialists, and graphic designers worked in tandem to uphold the site’s established structure, while creating a clinical and impressive new skin that positioned the company as a contemporary leader in the field of fluoride pharmaceutical supply and manufacturing. To address MPL’s dual service offering of Contract Manufacturing and Public Health Solutions, DDA organized site contents into two clearly defined segments. Upon first visit to the site, prospect consumers and contractors find the information they are looking for immediately thanks to the straightforward and cleanly designed site navigation system. The updated aesthetic is clinical and eye-catching, enhancing MPL’s established branding identity and matching the company’s state-of-the-art and professional practices with an equally high-tech and sophisticated design. At a glance, site visitors clearly understand the company’s impressive capabilities and service offerings as a result of a sleek rotating banner. Integrated seamlessly with the site’s design, this banner is comprised of attractive imagery and expertly-honed marketing messages that encompass the company’s full suite of service offerings. 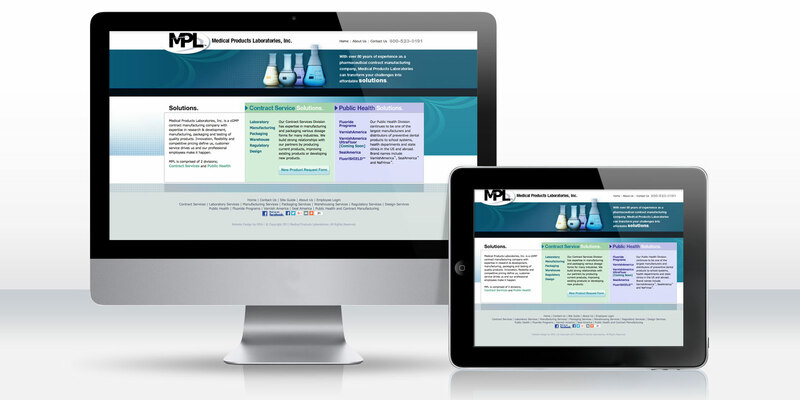 For MPL, DDA was able to establish a strong web presence by maintaining the solid SEO foundations first laid in 2006 and enhanced over the years, while creating a fresh new look that reinforces the company’s standing as a current and leading fluoride pharmaceutical manufacturing and distribution powerhouse.